Home » LibraryReads » SOURDOUGH + DEAR FAHRENHEIT 451 = September 2017 LibraryReads picks! SOURDOUGH + DEAR FAHRENHEIT 451 = September 2017 LibraryReads picks! HUZZAH! 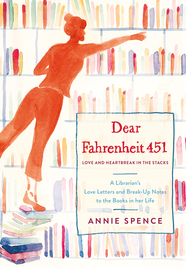 Both SOURDOUGH by Robin Sloan and DEAR FAHRENHEIT 451: Love and Heartbreak in the Stacks by Annie Spence are September 2017 LibraryReads picks!